What can we learn when a Hollywood TV show gets into ChangeMaking? Comedy show Brooklyn 99 took on police racism. How did they do it in a way that people didn’t turn off? ARCHIE SOT: That’s just stupid, there Jefferson. Besides, getting elected, there’s more to it than just being smart. HOST: This is a scene from the 1970s sitcom All in the Family. Archie Bunker is a white, working-class bigot. But a loveable one. He’s sitting in his armchair, talking to his new neighbour, George Jefferson, who happens to be black. ARCHIE: We ain’t got a black President, because God ain’t ready for that yet. HOST: Archie Bunker’s son-in-law, a baby boomer walks over. SON-IN LAW: Wait a second. What? ARCHIE: That’s right, God’s gotta try it out first by making a black Pope. Which he ain’t gonna. HOST: Archie’s daughter chimes in. DAUGHTER: Is that all you can talk about? Whether a black man or a white man should be President? ARCHIE: What do you want to talk about little girl? DAUGHTER: I wanna talk about a woman President. DAUGHTER: Mr Jefferson, this may come as a surprise to you but women are much more oppressed than blacks. JEFFERSON: I don’t see no ghetto for women. DAUGHTER: What do you call a kitchen? JEFFERSON’S WIFE: I call it a prison. HOST: All in the Family was remarkable for its time. Around Archie Bunker, the world was changing. Blacks were moving into his street, women were talking back to him. And every episode Archie gave voice to his misgivings while being forced to accommodate the new reality. In this episode of Changemakers, we’re going to Hollywood, looking at the role of art in making people think differently about the world. How do you challenge an audience, but do it in a way so that they don’t turn off? And what can Changemakers learn from that. 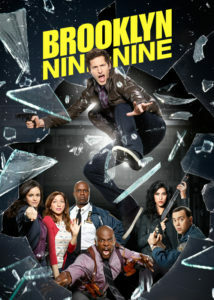 If you don’t know Brooklyn 99, it’s a sitcom set in the offices of a police station in Brooklyn, New York. It’s one of my favourite shows on TV — it’s definitely worth checking out. Twenty years ago, mainstream network sitcoms where overwhelmingly white. The cast of Friends for example, despite the characters living in New York – one of the most diverse cities on earth. Fast forward 20 years, though and things have changed. Brooklyn 99’s cast actually looks like they come from Brooklyn. That’s not an accident. Dan Goor is one of the show’s creators. DAN GOOR: The borough of Brooklyn is incredibly diverse and we really like that when we were setting it up because we thought that would allow us to tell all sorts of different stories and not just diverse with respect ethnicity and race but also class and education. HOST: So the show was designed with diversity in mind. Dan had worked with his co-creator Michael Schur on another sitcom, Parks and Recreation, whose cast was overwhelmingly white. Dan says that there were selfish reasons for making Brooklyn 99 very different right from the start. DAN GOOR: when you go into your 100 episode you are starved for material. So having lots of different people from lots of different backgrounds is selfishly a great thing for a storyteller. And then the other thing that it allowed us to do was to audition everybody and cast the best people. We didn’t have to limit ourselves at any point in terms of who in terms of whom we hired. HOST: So it wasn’t tokenism. We’ve all seen tokenism on TV. Where there’s one Asian, one Latino, one black and two whites. Oh, and perhaps someone who isn’t straight. DAN GOOR: what we were trying to do was be progressive by not hitting these issues on the head but by normalizing them which is why we for instance have two Latina cops neither of whom is sort of stereotypically Latina. We don’t have like us spicy so to speak character. They are just people who happen to be Latina. And in that same way Captain Holt is gay but his being gay isn’t the joke. It’s just a part of his backstory and that was sort of the sort of most progressive aspect of the design of the show. HOST: If you think that was a small deal, reflect on this: it had never been done before. Even the actors being cast in the roles just assumed this was another network sitcom, with the same unwritten rules about casting. Terry Crews plays Sergeant Terry Jeffords on the show. TERRY CREWS: I mean just the fact that we have two main Latino characters on our show is absolutely groundbreaking. HOST: That’s right. Because the conventional quota was one. But the creators wanted to cast both Melissa Fumero and Stephanie Beatriz, both of whom are latina. TERRY CREWS: You know both Melissa and Stephanie will tell you they thought oh my God one of us got to go because it’s never been done before. HOST: So by breaking the unwritten rules of how to put together a network sitcom, Dan Goor and his co-creator Michael Shur created a universe that role modelled how the world should be. And the characters weren’t just diverse. They were goodies. The show was a utopia. Perfect for a network sitcom, because it makes for easy watching. And from a Changemaking perspective, Brooklyn 99 is an extraordinary feat. DAN GOOR: Part of the aim of the original aim of the show I was just showing an office place a workplace full of people who genuinely love each other genuinely get along who are genuinely good at their jobs and who all come from very different places. That in and of itself is a statement of some kind. HOST: So far so good. But there was a problem. HOST: A creative problem with the way the show was designed. It’s fine for a cop procedural where all your cops are one big happy family of diverse, enlightened people. But what happens when you want to confront head on the idea that that sometime cops can be a tinsy bit racist? HOST: Terry Crews is currently playing a cop, he’s spent his whole life being an African American. Unfortunately this means he has a deep well of personal experience of the racism of American police. TERRY CREWS: When I was a football player and I had to buy a ticket and cash in order to make the flight and I went I was going from Kalamazoo Michigan to Chicago and in Chicago I got pulled off the plane by police officers and whom I didn’t understand it was in front of everyone and I was totally embarrassed. You know I felt like a criminal. But they didn’t tell me what I did and then and then they found out that I was a professional football player. And then they were like oh this is great can we get an autograph which I found out later that day. I was a drug dealer because simply because I bought my ticket in cash and this is just some of the experiences that normal you know you would think in America you should be able to buy a ticket in cash you should be able to walk around you should be able to have tinted windows if you want. Yes. All these little things that most Americans take for granted. As an African-American you looked at as a suspect and it’s just not right. It just isn’t. HOST: And that’s just the casual racism that every person of colour in America deals with on a daily basis. Now, imagine being in the script room and trying to come up with a plot line about that sort of racism, when all the cops in your show are goodies. It’d be hard right? Dan Goor says it was a real conundrum. DAN GOOR: If we were show that was not about cops then doing an episode like this we could have one of our characters be a victim which obviously is what we ended up doing or they could sit on the sidelines and talk about an incident which is what a lot of shows end up doing. But it was very hard because in a lot of the initial breakings of the story you want your characters to be involved but at the same time as you just said our guys are not the bad guys there are not people who would do this. Furthermore our guys are so so much the good guys that it’s hard for them. It’s hard to even do a story where somebody else has done it or it’s been done to one of our characters and our guys have an attitude that would present conflict. HOST: If that weren’t difficult enough, the writers of the show didn’t just want to make an episode about casual racism in the police. They wanted to take on the larger systemic issue that police kill black people in far higher proportion than every other race. Black people make up just 13% of the population, yet account for 31% of all people killed by police. The figures are even more disporportionate when the victim killed by a cop is unarmed. It’s an issue that had been brought to light through the Black Lives Matter movement, but had yet to permeate its way into breezy network sitcoms. HOST: Phil Jackson was the main writer assigned to this episode. PHIL JACKSON: I’m an African-American man in the United States of America. So that you know just by virtue of that it was a topic that I thought would be fantastic if we could find a way to put together an episode that spoke to the issue got to the complexities of it and you know also in the process brought some laughs along the way just to kind of provide some relief to the gravity of the topic that we were talking about. INTERVIEWER: It’s almost in contrast to I mean people are being shot in the United States. It’s incredibly depressing and serious. And the level of racism in sort of white supremacy is escalating. INTERVIEWER: How did you think that you are going to be able to turn that into something that could be funny? PHIL JACKSON: This is a topic with so much complexity so much gravity so much pain to it. How do we present it in a way that makes it and let it be known that we’re not making light of the issue that kind of honors the depth of the topic while also still staying within the voice of the show and providing providing some laughs because at the end of the day it is a comedy show. HOST: So, like they’d do with any episode, they started brainstorming. The brainstorm was: ways to talk about violent racism on a breezy comedy. INTERVIEWER: What was some of the ideas you rejected. PHIL JACKSON: I mean there was one idea that got pretty far along and it was whole and Terry and Jake are going to Jake’s alma mater. And it ends up that they’re talking to a class that has a large concentration of African-American students and then the conversation just starts to get real. PHIL JACKSON: But at the end of the day I think even that version of taking on the topic in this story literally it’s a school. So it kind of started to feel like an after school special you know. HOST: What’s an after school special? PHIL JACKSON: when I think of an after school special I’m 33 years old. I think of the 90s. And literally you get home you watch TV and there’s of it’s like a quote unquote very special episode that deals with drugs or deals with harassment or deals with something topical from a sociological standpoint. HOST: The first breakthrough came when they realised that the main character in the show, Jake – played by Andy Samberg – who usually had the main plotline, shouldn’t have this plotline. PHIL JACKSON: It also felt like while we could craft a story were you know Jake is in the main story or at the center of the conflict this really after breaking an episode like that kind of partway through felt like this episode is best served if we just keep that between our African-American characters. HOST: In some ways, this decision was in keeping with new way they’d designed the show. They’d broken the rules on how it was cast, and they were going to break the rules about having a main character in the main plotline. It unleashed the episode. Instead, they decided, the main conflict would be between the two African American actors in the show. Terry Jeffords, played by Terry Crews. And Captain Raymond Holt, played by Andre (Brouwer) Braugher. PHIL JACKSON: Once we realized that we wanted it to be between Holt and Terry it kind of made things a little bit easier. PHIL JACKSON: So then it was like OK well it might be interesting if Terry has to deal with the complexities of being not only a black man but a police officer. And this idea of are you black or are you blue. And what that means for him that started to feel like oh that’s an episode of Brooklyn I9. HOST: So they took Terry Crews’ real life run ins with cops, and decided to base a story around that, with all the tensions of him being both a black man and a cop. HOST: But there was a problem. They couldn’t work out where the conflict between the characters would come from. Conflict is what drives a story, and yet every single character in the main cast. DAN GOOR: Everyone was immediately as you saw on Terry’s side. HOST: The result was, they had no idea how to create an episode that worked. DAN GOOR: So we really stalled out in the writing of the story. HOST: So they knew they wanted Terry to be threatened by a racist cop, but because everyone around him would immediately take his side, it was hard to see how to get an episode that wasn’t a whole lot of people agreeing with each other about how terrible that was. Hardly scintillating viewing. After we come back, how the writers managed to salvage the episode. HOST: Are you on Facebook? Twitter? Instagram? Nowadays everyone has a platform. Today we’re talking about the creative challenges of being changemaker when you’ve got a creative platform to speak from. Dan Goor and Phil Jackson found themselves with a platform. It wasn’t a twitter feed or an Instagram following. It was network sitcom, Brooklyn 99. But when thinking of how to talk to your audience in some ways, the same principles apply. HOST: Whether you’ve got a network sitcom, or blog or Youtube channel or even your own personal twitter feed, the creative challenges are the same. How to tackle an issue while staying true to what you are? For Dan Goor the problem he faced, was finding conflict in their plotline. He knew they wanted an antagonist – racist cop from another precinct – a minor character brought in just for the episode. And they knew the antagonist was going to bail up Terry, one of their African American characters, at gunpoint, when he is off duty and out of his uniform. The problem was that to stay true to the way Brooklyn 99 operates, the story had to come from conflict arising between the main characters. Yet all the main characters would on Terry’s side. Or so Dan thought. Dan says the breakthrough came one day when he was talking to Andre Braugher, who plays Captain Holt — Terry’s African American boss. DAN GOOR: I brought Andre Brower in and I was telling him about the episode and I said and then we get to this point where Terry goes to you and says I’d like to file a complaint of course you say you have your back and then I said I don’t know where we go from there because at that point, there’s nothing left to do. HOST: But rather than sharing Dan’s concern there was no conflict there, Andre had a different perspective about how his character would react to Terry’s complaint. DAN GOOR: And he said but I don’t think Captain Holt would have his back. And I was like what. And then he gave a very intelligent cogent argument for why he thinks or thought that Captain Holt wouldn’t want Terry to submit that complaint and almost everything he said ended up in the episode. HOST: Sorry — did Dan Goor just do Captain Holt? HOST: That was very special. Anyway, Andre Braugher’s suggestion was that Captain Holt would think filing a complaint would be a fool’s errand. That when you’re a black man in the police force, you always have to be picking your fights, and Terry would make a lot of enemies by filing a complaint against a fellow cop. DAN GOOR: Captain Holt’s point was there’s a bigger mission here. And sometimes you have to lose the battle basically to win the war. And Terry in the end is saying I don’t want to lose the battle if we lose the battle we lose the war and then Holt comes around to his point of view. HOST: The episode’s writer says as soon as Andre suggested that as the fulcrum of where the conflict lay, everything started falling into place. HOST: Suddenly the plotline unfolded easily. PHIL JACKSON: So Holt saying oh you know what. I think that you should think about the broader picture you’ll be able to impact change if you don’t necessarily report this guy. And also there can be negative ramifications for your actions if you act against this one man in this one circumstance where as Terry is saying I’m thinking about right now I experience injustice right now and I want to do something about it right now with the person who did it to me in this particular moment. So it’s was a balancing act of keeping them on the same page in the same almost violent agreement as far as the injustice that occurred. But giving them a different point of view on how to kind of react and act given the situation at hand and that’s that’s kind of what broke the episode open and how we landed on the idea. INTERVIEWER: Have you been harrassed. PHIL JACKSON: I mean. Yeah but you know it’s you know it’s just one of those. It’s just one of those things you know that that happens you know. INTERVIEWER: But you know I think a lot of people don’t know that you know. PHIL JACKSON: Yeah. Yeah it’s really interesting you know like race in America. It is a very real thing. And there is I would say like writing this episode I know it’s interesting your question was how much of myself is in there. I would say it’s like 0 percent and 100 percent you know like I’m not Terry Crews and I’m not Andre Brower but at the same time I 100 percent was so excited and so passionate about writing this episode just given the topic that it is and having you know relatable experiences just just you know growing up in America. HOST: So they make the show. And, Phil Jackson says there was almost immediately a feeling within the cast and crew that they were making something special. PHIL JACKSON: I had a crew member talked to me and told me that it was her favorite episode that Brooklyn has done which I was like Oh that’s fantastic. I think everyone worked really hard on it. And we we came up with it together and so I think yeah I think it’s you know I think it turned out well you know and as a result you know the crew was excited that we were taking on this topic but also doing it in a way that kind of you know was a bit savvy but simple enough and provocative enough for people to still kind of watch and think. But also at the end of the day enjoy too. HOST: In fact, the network decides to put it on during the sweeps. The highest rating period of the year, when all the shows are putting on their best episodes. If you want to watch it, it was called Moo Moo, and it’s in Season 4. CLIP FROM PROMO: It’s an all new Brooklyn 99 that isn’t afraid to get real. KID: Why is daddy in trouble with the cops? Is it because he’s black. HOST: It gains a small but significant amount of press. The New Yorker takes note. Reddit starts a subreddit about that episode. And the reason it worked? Dan Goor has a theory. DAN GOOR: The biggest thing that I learned in making this episode was that that every speech that you that in order to tackle issues any issue you have to do it in a way that is really true to your to your show. AMANDA: We’ve talked a little bit about the design of the show you just on the show back in 2012 if you were if you could rush back there in a time machine what would you do or actually what would you do differently if you were designing it now. DAN GOOR: That’s such a good question. It’s hard the hard question. I feel like I can answer almost like a parallel question to that show. Because I’m so I love the show and I love watching the show and I love our actors. The hardest thing about it is that there is that they all get along. There is no Archie Bunker in all in the family in our show. And I think an alternate version of our show would have had would have had a person in a position of authority who never became their friend and potentially who was a little bit backwards. A lot backwards when it came to social issues so that there was room so there would be room for argument and discussion. In other words if you had an eye. And I actually I think I prefer the version of the show that we have now but an alternate version of it would be that you have a white cop like a white male cop who’s the captain and who is a little bit sexist and a little bit homophobic and a little bit racist and sort of represents a vision of what the police were or may still be that is not as progressive as the rest of our cops and our cops are constantly butting heads with him. That would be that would be an alternate version of the show which would also be interesting and would be a very different show but episodes like muumuu would probably be a lot easier to to write because you would have your antagonist in-house already. HOST: Phil Jackson has a different perspective. PHIL JACKSON: The conversations were necessary conversations the breaking of episodes and then throwing them away all led us to a point where we found the right story. So I think I would I wouldn’t I wouldn’t change a thing. HOST: He’s remains immensely proud of the episode they ended up making. PHIL JACKSON: So I think the role of art is to be provocative and take on issues and you know it’s it’s it’s a network ensemble comedy so you know is it the edgiest episode of TV that you’ll ever see? No but I also don’t think writing the edgiest episode of TV would have been the right move for the tools that we had and the characters that we have on this show. INTERVIEWER: Did you learn about how it’s possible to make change in the world in this medium in this space. PHIL JACKSON: Maybe somebody will see that and have a hard conversation with somebody who’s not been speaking the right way. So I think the thing that I learned is that you know it’s it’s everyone can do. Like just you know a little bit to help push the country forward push the world forward in the right direction and it doesn’t have to be one fell swoop. In fact it probably never happens that way.